State Library Victoria – Arts on Film : Cosi Fan Tutte. Arts on Film : Cosi Fan Tutte. 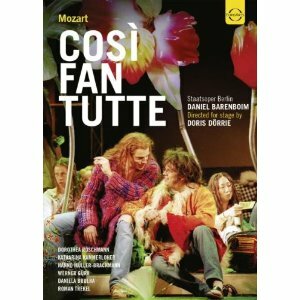 Cosi Fan Tutte : an opera in two acts by Mozart is the next program in the Arts on Film series to be screened this Wednesday June 26. Please note that due to building works in Arts, today’s program will screen in the Activity Lab – off Trescowthick Information Centre. Please assemble at the Arts Information Desk by 12.00. You will then be taken across to venue. Mozarts famous opera is reinvented as a “hippie musical,” by director, Doris Dorrie in a stunning production featuring Dorothea Roschmann as Fiordiligi, Katharina Kammerloher as Dorabella, and Hunno Muller-Brachmann as Guglielmo. With soloists and chorus of the Deutsche Staatsoper Berlin (Berlin State Opera). With the Staatskapelle Berlin, conducted by Daniel Barenboim. 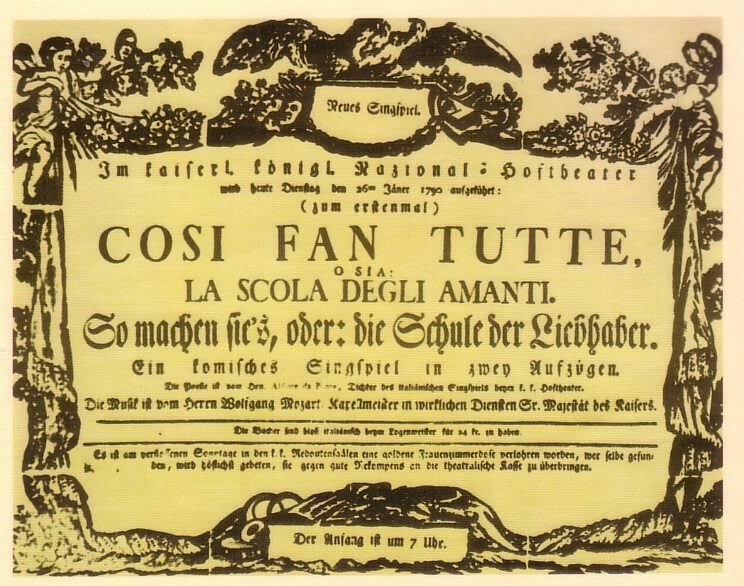 Cosi Fan Tutte was first staged in Vienna in 1790, and is a timeless opera that displays Mozart”s delight in juggling the comic and serious. The opera is performed in Italian with English subtitles. It was recorded live at the Deutsche Staatsoper, Berlin (Berlin State Opera) in 2002. 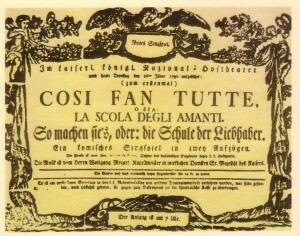 Cosi Fan Tutte, first performance. Theaterzettel der Uraufführung von Così fan tutte am Burgtheater Wien, 26. Januar 1790. Courtesy Wikimedia Commons. Cosi Fan Tutte commences at 12.00 noon and concludes at 3.00 pm (approx). Again, please note that due to building works in Arts, today’s program will screen in the Activity Lab – off Trescowthick Information Centre. Please assemble at Arts Information Desk by 12.00. You will then be taken across to venue. Admission is free. No bookings required, but come early as seating is limited. Enjoy!